One charismatic Peshwa leader of Maratha Empire, who has won every battle fought against enemies but is challenged to handle internal battles of family and society. One dauntless warrior, who has put everything on stake to unite with love of her life. One elegant Peshwa queen who is caught in the conflict between morality and jealousy. There is an on going war being fought between draconian societal laws, self proclaimed religious fanatic leaders, scheming politicians, backstabbing family members, responsibility towards family and nation and all of them against Shrimant Bajirao Ballal Bhat. For the role of Peshwa Bajirao, I can say with great degree of confidence that no in Bollywood could have played it better than Ranveer Singh. Confidence oozing out of every pore of his body, demeanor of a Peshwa leader, stern face of a warrior, authentic marathi accent and deft wrists holding his sword. I almost got goosebumps witnessing brilliance of Ranveer Singh in the film. He didn't act like a Peshwa, he became a Peshwa for Bajirao Mastani. Your eyes won't believe that he is the same person who gave abysmal performance 6 months back in Dil Dhadakne Do. Deepika Padukone for once was fantastic in this film. Be it her acrobatics doing sword fighting , skillful kathak dance on "Mohe Rang Do Laal", anger on her face when she is slaying enemies and her fearless face when she counters arguments of her ill wishers. She looks drop dead gorgeous in Deewani Mastani song. Priyanka Chopra looks authentic marathi mulgi. Especially when you see Priyanka and Deepika dancing next to each other in Pinga, expressions of Priyanka completely stand out. Tanvi Azmi as Maa Saheb is extremely intimidating and her role is quite similar to Ila Arun's in Jodha Akbar. One main drawback of the film is extremely slow plot post interval. 80% of the plot is over by interval, rest 20% of the plot keeps going round and round.. then stretch and stretch. May be Kekta Kapoor dropped in to Bajirao Mastani sets in interval and told SLB - "Dude story is far from out, I can make 500 episodes of Kaahaanii Mastannyy Kayy from rest of the film. Wham, here goes all fact paced gripping story and starts Saas-Bahu-Souten family drama. Music of the film is above average but for God's sake there are 10 songs in the film which makes it a drag. Many times you just keep your fingers crossed that God.. they are coming together in a group.. one of the queen looks cheerful, please.. no song now.. no song now.. tananana..Ati man sukh payo ri, Albelaaaa sajan aaayooo reee :D Having said that you should definitely look out for Deewani Mastani title track and Malhari song picturized on Ranveer. What dance moves.. Energetic war cry celebrating the victory. Lovely steps by Ranveer Singh. Costumes, set designs, locations cinematography and visual appeal. Sanjay Leela Bhansali is the benchmark for it in Bollywood. Sets of palace durbar hall, Aaina Mahal, Shaniwarwada, costume of mastani are nothing less than even Hollywood standards. Verdict: Definitely a great watch in theater for its grandeur, splendid performance by Ranveer singh and a beautiful romantic love story. 1. 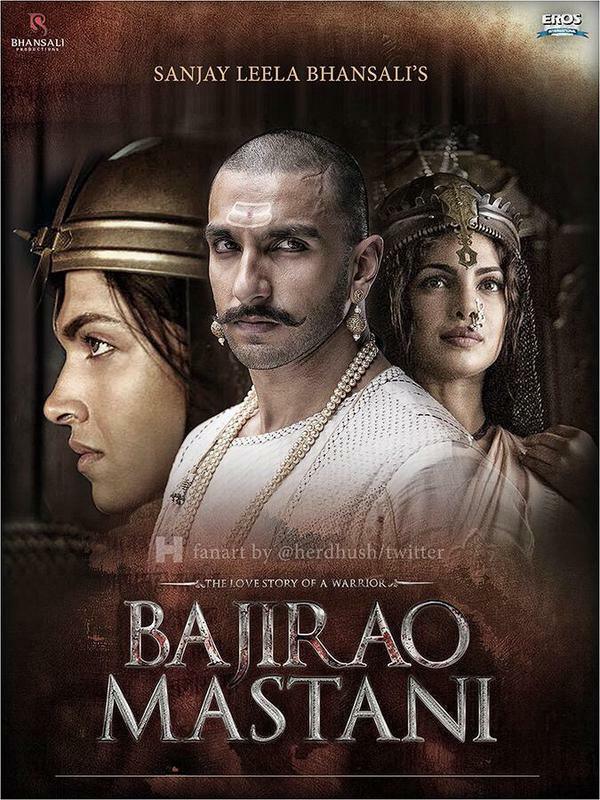 Bajirao Mastani is not only a historic film of 1700s but there is a history associated with it in Bollywood too! It was one of the deeply cherished project of Sanjay Leela Bhansali since 2003. He casted then famous love birds Salman and Aishwarya as Bajirao and Mastani. Alas, there was a rift and those 2 parted ways never to see each other eye to eye. Various actors considered for Bajirao included Salman Khan, SRK, Ajay Devgn, Hrithik Roshan and thankfully finally Ranveer Singh :), Dimple Kapadia,Shabana Azmi and Supriya Pathak were also considered for the role of Radhabai Bajirao's mother, which finally went to Tanvi Azmi. 2. SLB made actors learn Kalaripayattu for sword fighting scenes. Pandit Birju Maharaj was roped in to train Deepika in Kathak. Ranveer was trained to learn horse riding. Both Ranveer and Priyanka were trained in Marathi dialect spoken at the time of Peshwas. Deepika mentioned in one the interviews that she actually cried hard during one of the Kathak dance steps but SLB refused to budge! 3. Ending shown in the film is very tragic but reality wasn't so bad. Mastani was under house arrest when Bajirao went for the battle but she wasn't chained like a prisoner. That was just SLB being filmi :) Mastani was with Kashibai and Maa Saheb to perform final rites of Peshwa Bajirao. However, she committed suicide soon after her love was gone forever. 4. Film doesn't show what happens to son of Mastani and Peshwa, Shamsher Bahadur. Whether he was killed or left orphan? Well, Kashibai adopted him as her own and he was was bestowed upon a portion of his father’s dominion of Banda and Kalpi. He became a great warrior and fought 3rd battle of Panipat against Afghans and died in that at the age of 27.